NOAA Climate.gov provides science and information for a climate-smart nation. Americans’ health, security, and economic well-being are closely linked to climate and weather. People want and need information to help them make decisions on how to manage climate-related risks and opportunities they face. NOAA Climate.gov is a source of timely and authoritative scientific data and information about climate. Our goals are to promote public understanding of climate science and climate-related events, to make our data products and services easy to access and use, to provide climate-related support to the private sector and the Nation’s economy, and to serve people making climate-related decisions with tools and resources that help them answer specific questions. Thomas Karl (NESDIS/NCEI), Rick Rosen (OAR/CPO), Margaret Davidson (NOS/OCRM), Wayne Higgins (NWS/CPC), Eileen Shea (NESDIS/NCEI), Ko Barrett (OAR/CPO), and Louisa Koch (NOAA Office of Education). The NOAA Climate.gov project began as a rapid prototyping collaboration among staff from four NOAA offices: the Climate Program Office, the National Centers for Environmental Information, the Coastal Services Center, and the Climate Prediction Center. A prototype was first published in February 2010 so we could gather feedback to help us develop and evolve Climate.gov in user-driven ways. News & Features, for the climate-interested public, provides magazine-quality images, professional videos, and in-depth stories about how scientists are advancing understanding of Earth’s climate system, and how businesses, planners, and communities are reducing their vulnerability to climate variability and change. Maps & Data for scientists, specialists, and other members of the public, serves maps and data for understanding climate-related changes in the past and present, and possible future changes. Teaching Climate, for formal and informal educators, provides a ready-to-use collection of educator- and scientist-reviewed teaching resources that they can bring straight into the classroom or other learning situation. In taking this audience-driven approach, we assembled our data, information resources, and expertise from across our distributed climate science and services community (including NOAA and its partners) into a well-integrated online point-of-access for the four segments of the public described above. 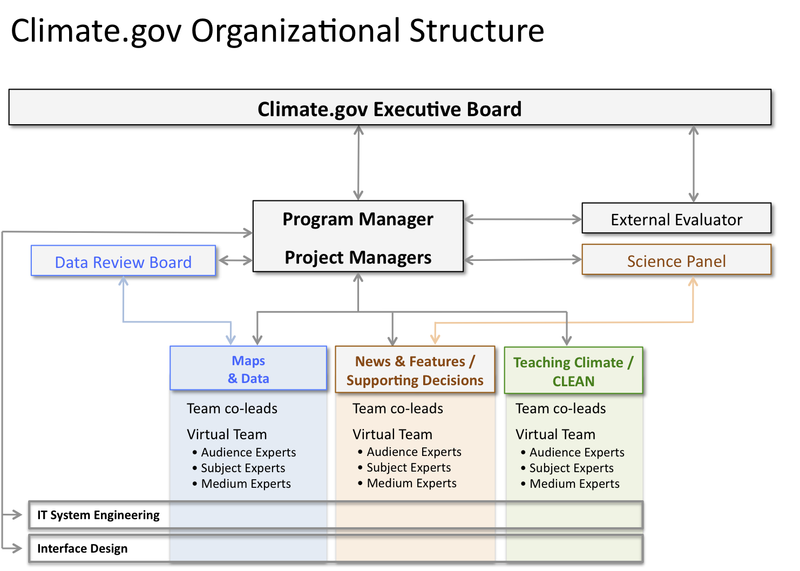 Our needs for a balanced and scalable approach drove the design of our Climate.gov organization structure (illustrated below). Behind each tab section of the portal is a cross-agency virtual team that plans and executes the day-to-day development and editorial processes of their respective sections. These teams are coordinated by an overarching Governance Team, comprised of the Climate.gov Program Manager and three Project Managers. The Governance Team establishes the priorities, scope, and objectives of Climate.gov; manages and executes the portal’s annual budget; convenes and coordinates the external review bodies (the Data Review Board, the Science Panel, and the External Evaluator); and reports quarterly to the Executive Board. The Executive Board is comprised of Senior Executive Staff from within the Climate Program Office (OAR/CPO), the National Centers for Environmental Information (NESDIS/NCEI), the Coastal Services Center (NOS/OCRM), and the Climate Prediction Center (NWS/CPC). This Board ensures Climate.gov is appropriately balanced in its overall presentation of NOAA’s and its partners’ climate science information and data products. The Executive Board recommends additions and adjustments to the priorities and scope of Climate.gov, as needed. Everything NOAA Climate.gov publishes is written by, or reviewed and approved by, subject experts prior to publication. Each of the Portal’s four sections targets different segments of the public for different objectives and so each section operates under different editorial policies and procedures, which are summarized below. This section publishes agency news releases, original web feature articles developed in house, and articles submitted from partner agencies and organizations. Modelled after an online science magazine, News & Features hopes to inform, inspire, educate, and entertain the science-interested public on topics in climate science, adaptation, and mitigation. This section’s content is based on the best available science, and all content is produced in consultation with or reviewed by one or more scientific subject matter experts prior to publication. When necessary to ensure accuracy and completeness, or to resolve conflicting opinions among reviewers, authors, and/or editors, the News & Features managing editor solicits additional reviews from NOAA Climate.gov’s Science Panel members, or other subject matter experts whom they recommend. For submissions from other agencies or organizations, the News & Features managing editor verifies that a similarly rigorous editorial procedure was applied. If the contributor’s review process is adequate, an article or other content does not undergo additional subject matter expert review prior to publication in News & Features. If the editorial procedures of the submitted article did not include a rigorous scientific review, the managing editor identifies an appropriate expert(s) to conduct a review prior to publication in News & Features. If necessary, contributors may be asked to revise their articles, have them re-reviewed by their sources, and to resubmit them. The News & Features editor does not make any revisions to submitted articles without the approval of contributors and, when necessary, their original subject matter expert reviewers. The NOAA Climate.gov Maps & Data section contains more than 280 descriptions of datasets and services spanning a wide range of climate-related subjects. This collection was assembled in an effort to add value by simplifying and enhancing the discoverability, accessibility, and utility of the data. This section aims to serve researchers, scientists, resource managers, business personnel, and other citizens who want to find and use climate data. Only those data products and services that comply with Federal Geographic Data Committee (FGDC) and/or International Standards Organization (ISO-9001) metadata standards are accessible through Maps & Data. FGDC metadata is a long-standing federal requirement that was adopted by NOAA Climate.gov to allow distributed datasets and products to be accessible and searchable from a central location. We have built upon this standard to ensure that key fields in the metadata record for each available dataset is populated with required information. The Teaching Climate section provides learning activities and curriculum materials, multimedia resources, and professional development opportunities for formal and informal educators who want to incorporate climate science into their work. The Teaching Climate section is dovetailing its content review process and procedures with those of Climate Literacy and Energy Awareness Network (or CLEAN, at cleanet.org) project. CLEAN is 3-year National Science Data Library (NSDL) Pathway project, begun in 2010 and funded by the National Science Foundation, established to build a small digital collection of teaching resources that are aligned with the Essential Principles of Climate Literacy and Energy Awareness. A summary of the review process is given below; a detailed description of the CLEAN Review Process is available here. In summary, the CLEAN review team consists of experienced middle school and high school teachers and college-level instructors as well as PhD-level scientists of relevant fields (climate and energy science, social sciences, etc.) and other climate literacy practitioners. The CLEAN review process was informed by review guidelines and criteria from other collections, such as the National Science Digital Library (NSDL), the Science Education Research Center (SERC) Guidelines, the Merlot criteria, and the Climate Change Collection. The CLEAN review criteria were tested and refined in multiple test review rounds and through review comparisons among different reviewers. At the core of the CLEAN review is a set of review questions to assess educational materials in three categories: (1) scientific accuracy, (2) pedagogic effectiveness, and (3) technical quality /ease of use. Reviewers answer questions about each resource, give an overall rating for each of the three categories mentioned above, and note any strengths and concerns. An overall qualitative recommendation (low, medium, or high priority) decides which path a resource takes through the review process. All teaching resources that pass through the CLEAN review process are subsequently presented to a panel of four reviewers (educators and scientists) during a review camp. This team of four specialists discusses each resource, and the reviewers’ notes from the previous review round, and makes the final decision about whether to include a resource in the CLEAN collection. All comments of the reviewers are compiled into annotations (notes to the user) on the science, the pedagogy, and the usability of a teaching activity. Reviews articles, images, presentations, videos, and captions prior to publication, as needed. Helps answer reader-submitted questions, or NOAA outreach personnel questions, as needed. Jessica Blunden (NOAA NCEI), Tim Boyer (NOAA NODC), Chris Burt (Weather Underground), Leo Donner (NOAA GFDL), David Fahey (NOAA ESRL), Katherine Hayhoe (Texas Tech U. ), Wayne Higgins (NOAA CPC), Sarah Kapnick (NOAA GFDL), Rick Lumpkin (NOAA AOML), Jeff Masters (Weather Underground), John Nielson-Gammon (Texas State Climatologist), James Partain (Alaska Regional Climate Services), Jared Rennie (Research Meteorologist, Cooperative Institute for Climate and Satellites - North Carolina), Richard Rood (U. of Michigan), LaDon Swann (Auburn U. ), Scott Weaver (NOAA CPC), and Kandis Wyatt (NOAA NESDIS). Helping to establish a transparent climate data review process for NOAA Climate.gov, to include refinement of metadata and data quality criteria. Recommends additions and adjustments for improving data discoverability, accessibility, interoperability, interpretation, and application. Reviews & discusses data sets proposed for inclusion in the Portal, and to recommend those which should be highlighted as good climatological baseline datasets. Helps resolve questions pertaining to which are the “best available” data products of a given parameter for default display in the Portal’s more prominent interfaces section, such as the Dashboard. Emily Fort (USGS), Gustavo Goni (NOAA AOML), Ann Keane (NOAA ESRL), Ed Kearns (NOAA NCEI), James Partain (Alaska Regional Climate Services), Mark Parsons (NSIDC), and Wei Shi (NOAA NCEP).